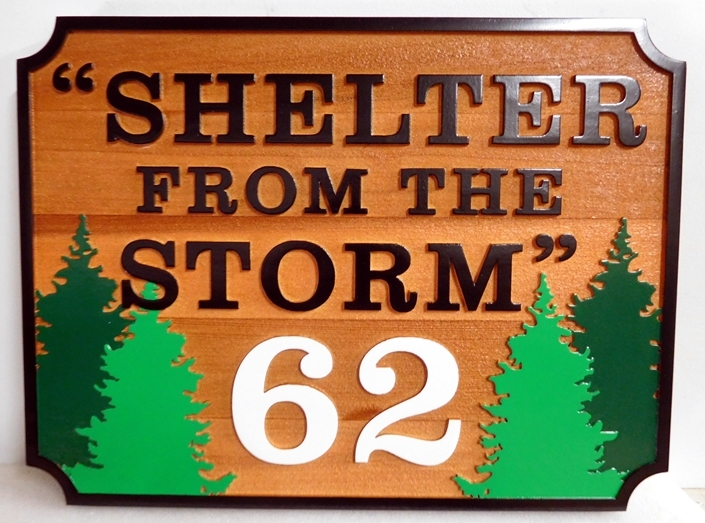 M22078 -Cedar Sign with with Spruce Trees, "Shelter From the Storm"
This natural-looking but very readable Cedar wood cabin address sign has been carved in 2.5-D relief. The text outline, trees, and borders are raised. This outdoor Cedar sign is first stained , the text and art painted, and the entire sign is clear-coated twice as extra protection against UV radiation and rain and snow.The sign can be mounted on a wall or fence, on a post or between two posts, or hung from a wood or iron hanger from eye-hooks on the top.